Urine deposited on carpet does not stay there. It penetrates the fibers and contaminates both the backing of the carpet and the flooring material below the carpet (the sub- floor). Often, without your knowledge, pets will urinate continually in the same general location. Urine odors can permeate from the floor, be it cement or wood, from the tack strip, and even from the framework of the house behind the walls. As the urine dries the liquid evaporates but the urine crystals become even more concentrated and pungent. Simple cleaning will not remove this odor. 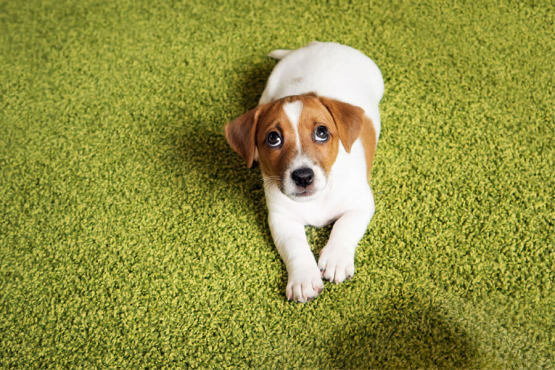 Pet urine can cause permanent damage to your floors and upholstery or fabrics and can also create an unhealthy indoor environment. When urine is first deposited onto a floor or fabric it has a pH of about 5 or 6, which is on the acid side of the pH scale. It is easier to remove right then when it is fresh, however, once it dries it turns “alkaline” or to a high pH between 10 to 12 on the scale and becomes more difficult to remove. The warm acid state of the urine offers a perfect breeding ground for bacteria which begin to flourish almost immediately. In this original acid state the urine begins to oxidize and react with the carpet to create a color change which will become permanent if the urine is not removed immediately. Some of this color change can be attributed to the strong ammonia that forms as the urine passes through a bacterial and chemical change. If left for days or weeks, depending on the fabric or floor type, it will change the dye structure therefore causing permanent staining. Even if the soluble deposits are removed the damage to the dye structure may already be done. There are two sources of odors associated with urine. The first comes from bacteria that grow abundantly in dark warm places with a never-ending food source. A pet can feed the bacteria daily! This bacteria growth and breakdown of the urine creates amino acids. These complex organic compounds will often work deep into the fibers to a point of becoming part of the fiber. This can present a challenging situation. The waste materials and gases from the decomposing urine create an unpleasant odor. When dried urine is re-moistened it gives off an ammonia gas. If smelled once it is seldom forgotten.The second source of odor is chemical odor that is present even when the bacteria have been killed. This explains the reason that more than sanitizing is necessary to neutralize odors from urine. Urine also presents additional odor problems when the relative humidity is high. The salts and crystals that are left behind as the urine dries are hydrophilic and draw water to them. Dried urine is often easy to smell in the humid months because the salts attract the moisture, the moisture evaporates putting out a greater proportion of odorous ammonia gas. You must get rid of the urine salts in and under the carpet to get rid of the odor. That’s why cleaning existing urine spots WILL NOT remove any associated odor. In fact, it could INCREASE the odor in the air space for a temporary period of time. Please keep in mind some methods are not permitted with upholstery or bedding. 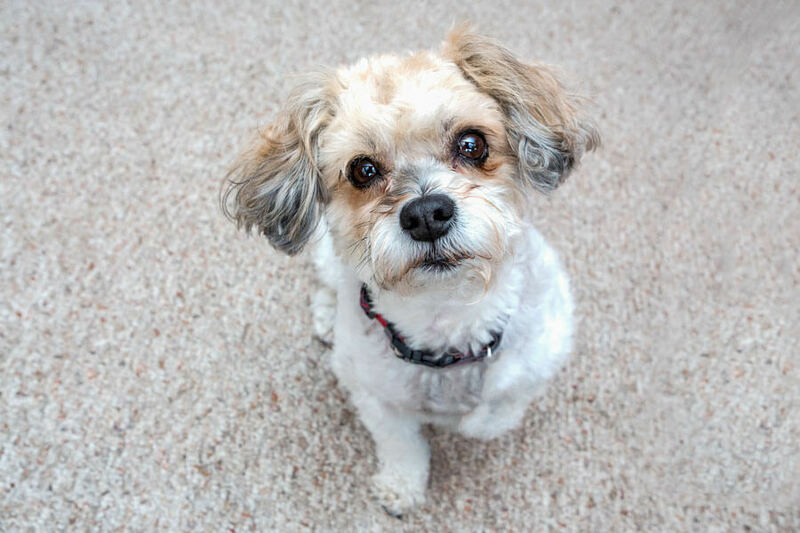 Option # 1 General Clean with Enzyme/Encapsulation – Our normal carpet cleaning with the enzyme/encapsulation is only 10% effective and may not remove the pet odor as the odor is possibly in the pad and sub-floor. To remove the odor, the source of the odor must be completely removed. The next most effective step is Option #2. Option # 2 Water Claw treatment *This process is several steps – 1.) Assess the area with a black light to determine the source of the odor. 2.) Spray a urine pre-conditioner deodorizing pre-spray to break up the uric acid and let dwell for 15 minutes to break down the crystal making extraction more successful. 3.) Flush fresh water through contaminated area then extract with water claw. The water claw is designed to extract the water and contaminates from the padding of the carpet. 4.) Flood contaminated area with an enzyme/encapsulation treatment to saturate and neutralize the contaminated areas odor, let dwell for 45 minutes. 5.) Flush fresh water through contaminated area then extract with water claw. The water claw is designed to extract the water and contaminates from the padding of the carpet. 6.) Topically apply a coat of enzyme/encapsulation to neutralize contaminated area odor. By removing most of the urine from the padding we are eliminating most of the odor as well. However, since the padding has pockets like a sponge and the sub-floor will hold odor as well and cannot be treated with this method, we are unable to remove all of the odor. This method is 50%-80% effective and may not eliminate the pet odor completely. To remove the odor, the source of the odor must be completely removed. For the most effective method see Option #3. Option # 3 Damage Restoration *There are several steps to this process as well – Remove affected pad. Clean back of carpet. Treat floor with an enzyme treatment. Seal floor if needed with an odor barrier. Treat back of carpet with Enzyme/Encapsulation treatment. Install new tack strip. Install new pad. Re-install carpet. Clean carpet. Topically apply Enzyme/Encapsulation treatment. With this option there is an 80%-100% success rate. However, there can be hidden urine in walls, door jams and other areas of the home emitting an odor that can go left untreated with this method. Disclaimer: No one method listed above is 100% guaranteed to remove pet urine from my home. To guarantee 100% removal I need to replace the carpet, padding, tack strip and seal the floor. If treating upholstery or bedding, replacement is necessary for 100% guarantee of removal. Green Steam will follow all the guidelines and standards provided by the IICRC (Institute of Inspection Cleaning and Restoration Certification) while treating my upholstery, bedding or carpets for pet urine removal.